I sort of disappeared from Petit Elefant around the beginning of June. Not intentionally. I thought I’d roll into another summer the way I have since 2007, when I started this blog. I’d have a lot of kids underfoot, out for summer vacation, all sand and noise and sweat and activities, but I thought I’d still pull out the laptop when I had a chance to make sure I stayed on top of the blog. A few things happened. One of them is that I’m 8 years older than I was when I started Petit Elefant, and with that age has come the realization that time is slipping through my fingers faster than I’m prepared to deal with. My 15-almost-16-year-old is a handful of years away from leaving the house to go to college. My now 11-year-old was a toddler when I started blogging, and will be entering junior high in a couple of years. Both of them are only home for short periods of time at the end of their days during the school year, so busy with extracurriculars and academic work. I just don’t have enough time with them, period. The second thing is that we were busy this summer. Remarkably so. I’d pull out my computer at the beginning of the day to start work and one child or the other would ask for my help or need my direction with something. Younger me might’ve slapped on some headphones (I cringe to even type that) and told them to figure it out. Or I would’ve hired a babysitter to deal with the kids and their various projects while I worked. But the closer I get to 40, and the more life experience I have, the more I realize how fleeting time is. Especially quality time with my children. So, I embraced the business of their lives instead of mine. Instead of making my busy more important than theirs, I put my kids at the top of the to-do list. Where was I this Summer? I’ll tell you. My son swam in a swim meet somewhere in the state of Utah, if not every weekend, at least every other weekend. When we weren’t at a swim meet we were at swim practice. Every day. I started the organizing your house series on Petit Elefant before I disappeared for the summer, and I spent the better part of the break purging everything I could get my hands on. I focused a lot on cooking for my family this summer. Real, actual, planned and organized, healthy meals for my husband and kids. This is something that totally fell by the wayside over the last 10 years of running a business, and I’m over it. I was grateful to focus on real meals, to get into the habit of making menus and shopping lists, and prepping solid meals again. I’ve been working on my health a ton in 2015, as much as I’m able to on my end. This means I spent the last few months going to bed at 8 p.m., waking up early with the kids, and napping in the middle of the day whenever I felt extra tired. It was glorious. 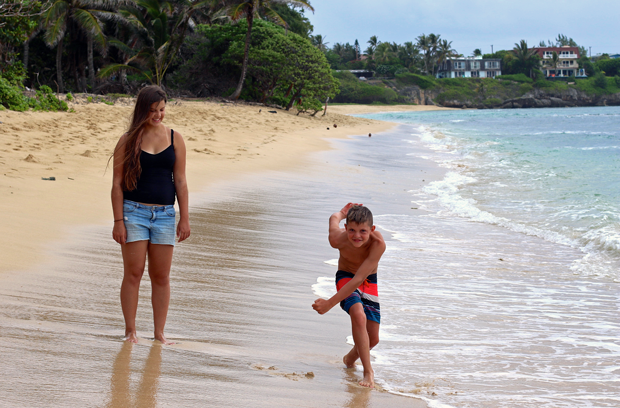 I didn’t travel a lot, I’ve scaled down the amount of work travel I do by about 80%, but I traveled a little, and then at the end of the summer we went to Hawaii for two entire weeks as a family. I didn’t take my laptop and I barely checked my phone. Delicious. There we go, and here I am! So let’s jump right into Fall together, rested and ready for whatever comes our way! I have a lot of organizing posts, recipes, DIY beauty + style, and a whole lot of travel fun up my sleeves, waiting to be shared with you. I can’t wait! Here’s to a glorious Fall.